Whether you're looking for a luxurious beachside resort, or a serene countryside getaway – we have the perfect babymoon destination just for you. Understated glamour and romance awaits in silver-sanded Menorca. Emerald-blue waters lap against the secluded Split shoreline in Croatia. Live the high life in one of the vibrantly painted cliff-edge towns watching over the prestigious Amalfi Coast. Or simply embrace the laid-back lifestyle of the locals on one of our Greek getaways. Whatever your babymoon bucket list, here's everything you need to know to make the most of your last holiday before bump arrives. Okay, first thing's first. You've no doubt seen the term babymoon pop up on social streams – but what exactly is this latest travel trend? Traditionally taken in the second trimester of pregnancy, a babymoon is a holiday taken by parents-to-be before the bundle of joy arrives. It's the perfect excuse to enjoy your last holiday as a couple and spoil yourselves while you still have the time and energy to do so. With sleepless nights on the horizon, embrace the chance to snooze in style. Our villas are an idyllic remedy for a truly relaxing pre-baby getaway. A perfect concoction of amenities and creature comforts, so all you have to worry about is putting your feet up. Perhaps you're after a pampering spa session, or a romantic stroll along a sun-kissed beach? Nothing says luxury quite like your own private pool and terrace. And if the temperature becomes a little too much, you can always unwind in your home away from home – air conditioning on of course! Blissful bays and peaceful days make Split a dream babymoon destination. Take your relaxation to another level with idyllic beaches and timeless towns still relatively undiscovered by tourists. The Riva Promenade is a seafront gem, lined with palm trees and colourful buildings, this place is always a good idea. Indulge your sweet tooth (and cravings) with a gelato or pastry in one of the nearby cafés and set up residence on one of the many benches by the water’s edge. 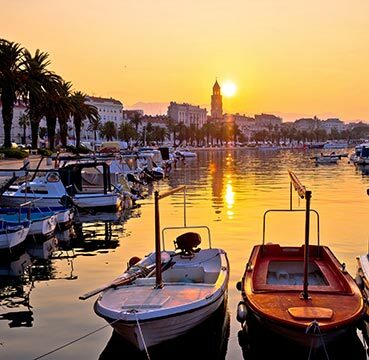 Watch the boats as they bob gently to the rhythm of the Adriatic Sea, and revel in the gentle breeze. You could easily spend the whole day here! As the sun sets into the horizon, soak up those final golden rays before strolling hand-in-hand along the cobbled streets. You’ll be spoilt for choice with swanky waterfront bars. Enjoy the buzz and hum of Croatian nightlife as you sip on your cocktail (non-alcoholic of course), or find a more intimate eatery and opt for a candlelit dinner for two. If energy levels are dwindling, adopt the laidback approach of the locals and recharge. Napping here is encouraged! So make the most of your villa and embrace late mornings and lazy afternoons in bed. Days spent lounging around your own private pool are just as blissful – you’ve found your pregnancy paradise! For the more venturesome couple, Dubrovnik is not to be missed! Around two and a half hours from Split, there are plenty of tour companies that can organise private and flexible day trips. Everything seamlessly arranged for you, relax and enjoy the coastal journey care-free. The views en route to Dubrovnik are worth the trip alone! As the magnificent walled city appears in the distance, it's easy to see why it's dubbed the 'Pearl of the Adriatic'. The beauty of old town is instantly captivating. Intertwined with gleaming marble-paved squares and dotted with palaces, churches and monuments. Fans of Game of Thrones will be in for a treat, with countless filming locations from the show! How many can you spot? Limit the amount of time spent on your feet. 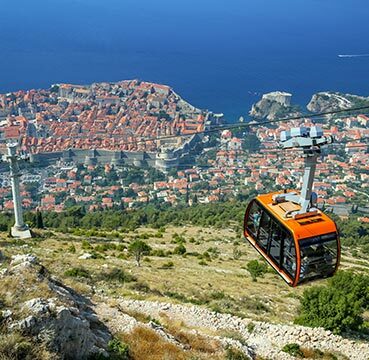 Take the cable car to the top of Mount Srd (doctor's permission permitting) for the best views of Dubrovnik! A mere four minutes to the summit, here you can enjoy a spot of lunch from the panoramic restaurant whilst taking in a bird's-eye view of the world below. Perfectly placed benches are just waiting for you to perch for a while and take in the breathtaking 60km of Croatian coastline visible from the top. If you're finding Dubrovnik too tempting to resist, why not have a look at our villas and stay here instead? Then Split is just a short day trip away! 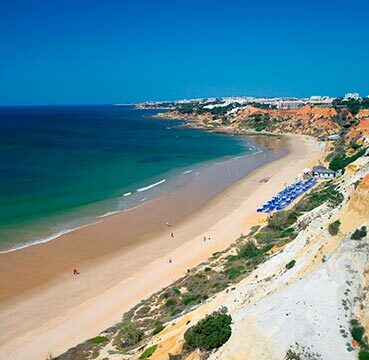 The alluring golden sands of The Algarve make for an idyllic babymoon destination. Kick-back and enjoy the finer things in life from one of our hand-picked Holiday Resorts or beautiful villas. The decadent Pine Cliffs Resort is a winning choice for couples looking for all things lavish and luxurious. With its five star reputation and first class service, the accommodation is truly outstanding. Award-winning facilities, spacious living areas, state-of-the-art technology and superb restaurants and bars – plus the biggest spa in the Algarve. Here's a haven you won't ever want to leave! If you do manage to tear yourselves away, you can enjoy a leisurely stroll around the beautifully landscaped gardens of the resort, or amble across the cliff tops high above the soft golden sands below. With sandy stretches as far as they eye can see, there are plenty of places to sneak off and find your own secret spot to soak up the natural beauty. The Atlantic waves offer a cooling dip for when that glorious year-round sunshine gets a bit too much. Look no further than the nearby town of Olhos d'Agua for a change of scenery. Centred around a sandy cove, this little fishing town is full of welcoming charm and low-key ambience – perfect for expectant parents looking for a relaxed day out. Here you can embrace the unhurried Portuguese lifestyle and café culture. Indulge in a sweet treat (after all, you're eating for two!) and watch the world go by. If you're looking to mix things up with a change of pace, the bustling resort of Albufeira is within easy reach. Here you'll find plenty of shops to whittle away the hours, with all the usual high-street culprits available. There's also a huge range of cosmetic shops, and a retail park with several outlet stores. What better excuse to treat yourself and indulge in a spot of retail therapy? The Amalfi Coast oozes decadence and indulgence. 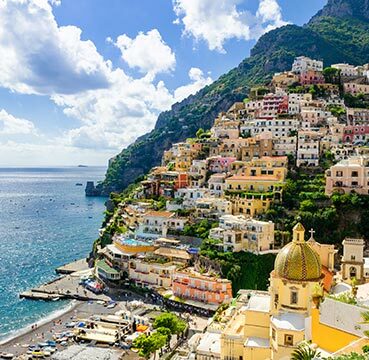 The sheer cliffs and rugged shoreline offer a sublime backdrop for your babymoon – with arguably some of the most picturesque and magnificent vistas in all of Italy. Enjoy a relaxing drive along the winding, coastal road that stretches between Punta Campanella and Vietri sul Mare. Peer down to the shoreline below and you'll see the mountains plunge into the sea. Breathe in the sweet aroma of lemon – an iconic symbol of Sorrento and the Amalfi coast – and see if you can spot the lemon groves growing high up into the mountains. No matter where you look, prepare to be surrounded by a wealth of jaw-dropping natural beauty. For a romantic day trip, head out to the Island of Capri. The water here is impossibly blue and the little town pristine. This may just be the most perfect place on Earth! If the seas are calm, take a boat trip around the island and stare in wonder at the cove-studded coastline. Be sure to watch out for the Lover's Arch (or tunnel of love), that sits to the east of the island. Once safely back on dry land, indulge your sweet tooth in one of the mouth-watering gelaterias and explore the chic boutiques and shops that line the streets. As evening rolls round, embrace your last holiday as a twosome and visit one of the spectacular terrace restaurants Capri has to offer. Sample delicious, traditional cuisine and savour the intimate atmosphere. You may not be able to drink, but you sure can eat. Make the most of it! Back on the mainland, take in the panoramic vistas from the privacy of your outdoor pool. Shut yourselves off from the world, unplug and reap the benefits of your home away from home. There's something to be said for sitting back and simply enjoying the stunning surroundings. Comfortable furnishings, air conditioning and spacious living areas all add to the care-free, laid-back lifestyle of holidaying. It's important not to overdo it. And if those pesky cravings kick in, your partner can nip out to scour the local supermarket and cafés. The sun-kissed curving bays and rocky inlets of Menorca offer up the perfect serving of calm and charm. An island that is delightfully low key – you've got the perfect place to mellow. Sit still, absorb the atmosphere, and recharge your batteries. A babymoon is all about rest and relaxation, so catch up that much needed sleep in the comfort of your villa. You've earned it! A true back-to-nature island, Menorca is all about the simple things. Beaches off the beaten track are a perfect sanctuary for peace and tranquillity. After all, you're about to be joined by a new arrival – so those moments of quiet are precious gems to be treasured. The shallow waters and gently sloping sands are the perfect combination for you and bump to take a dip. 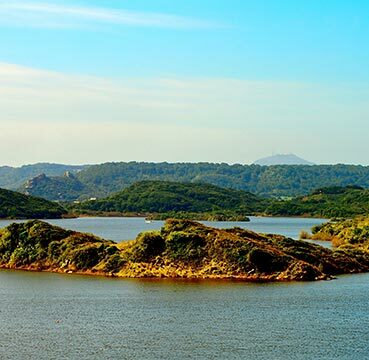 Breathe in the sweet scent of lush woodland and head to S'Albufera des Grau Natural Park. A jaw-dropping amount of creatures and plants call this place home. From turtles to wild olive trees – this is a nature lovers dream! Pathways and trails are scattered across the park, and with a well-equipped centre close by you'll have plenty of facilities at your fingertips. If you're brave enough to venture towards the rugged coastline, you'll be rewarded with gorgeous views over unspoiled coves. Here you can laze away the day watching the waves crash against the shore, mesmerised by the soothing sounds and breeze in your hair. A relaxing spa session is the pièce de résistance to a perfect babymoon. With a generous selection of prenatal treatments available island wide, the only question you need to ponder is whether to get a foot or back massage (or maybe both!) Feel nurtured and supported in a time that your body is experiencing constant change, and make the most of these last few moments being pampered from head to toe. A huge range of flights are available from a number of charter airlines including Tui, Thomas Cook, Virgin Atlantic and British Airways. Now you have an extra passenger on-board, it may be worth upgrading to premium, business or first class. After all, you’re going to be on the plane for a few hours – so why not fly in style and opt for a more spacious seat? There’s other perks too, from a bigger TV screen to priority access at bag drop – meaning less waiting around and more time to unwind. Pre-arranged transfers are a great way to ensure your post-flight peace of mind. Don’t worry about waiting in line to pick up your car, a friendly driver will be on hand to meet you and drive you safely to your accommodation. There’s nothing stopping you from picking up a hire car at a later date, but this way you’re at the doorstep of your villa long before most people are leaving the airport! One word – freedom. The benefits of a hire car on your babymoon are countless (unless you holed up in your villa for a week and make the most of total seclusion). You’re free to come and go as you please and explore at your own pace. And you won’t have to worry about the local bus being temperamental, or a timetable being a tad unpredictable. You’re in complete control. With a huge range of car options, you’ll be able to find the perfect level of comfort for you and your precious cargo. Getting the proper cover has probably never been so important. Our travel insurance offers a comprehensive range of cover to suit your needs. Not to mention emergency medical cover up to £10m and a 24hr Medical Assistance Helpline.